Heat oven to 350°F. Lightly spray 9-inch round cake pan or glass pie plate with cooking spray. If using crescent rolls: Unroll dough; separate into 2 long rectangles. Overlap long sides 1/2 inch to form 1 large rectangle. Press seam and perforations to seal. If using dough sheet: Unroll dough. Spoon small amounts of cookie dough evenly over crescent dough; press or pat to evenly cover. Sprinkle with pecans. Starting at long side, roll up; pinch seam to seal. Cut into 12 pieces. Arrange cut side up in pan. Bake 28 to 35 minutes or until crescent dough is golden brown. Cool 15 minutes. Meanwhile, in small bowl, mix glaze ingredients, adding enough milk for desired drizzling consistency. 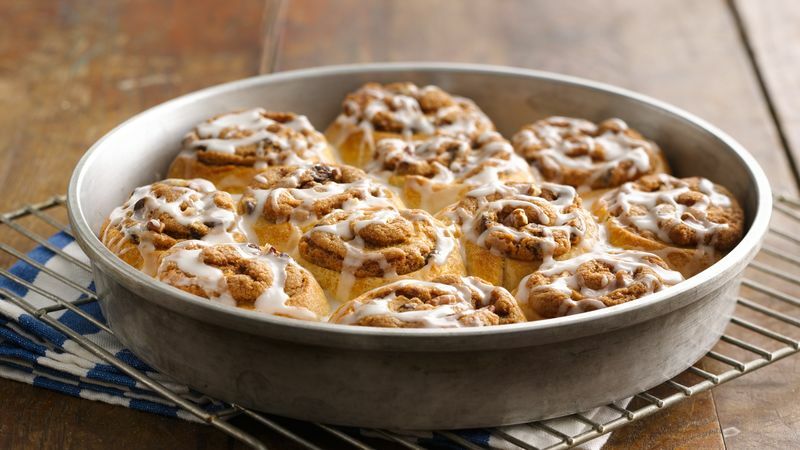 Drizzle over warm rolls. Serve warm.